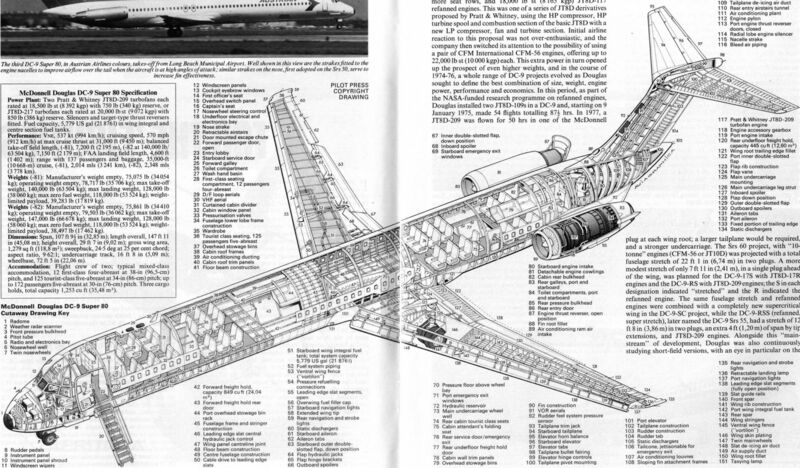 First to bear the DC-9 designation was this 1959 project for a baby DC-8, as described in the accompanying text. 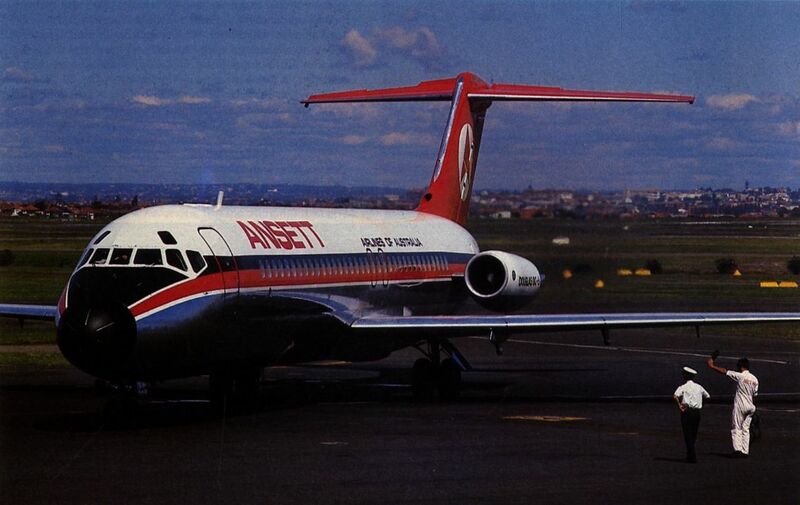 A Srs 30 of Ansett Airlines of Australia taxies for take-off from Sydney Airport. 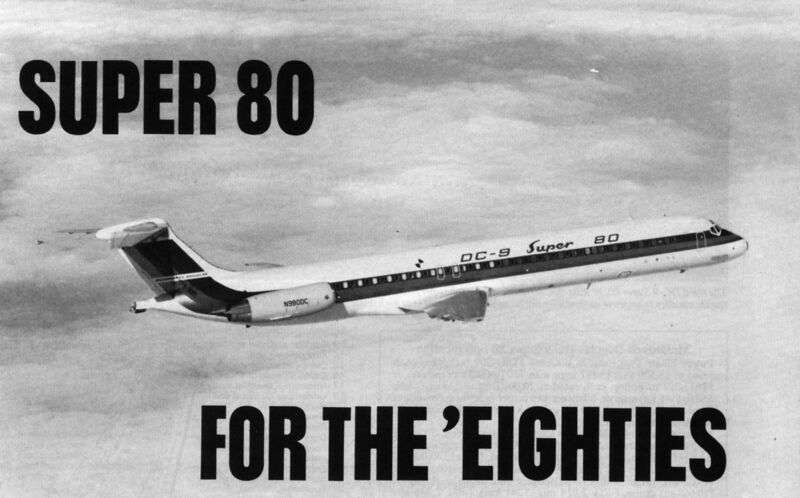 Until the Super 80 enters service later this year, the largest of the DC-9s is the Srs 50, represented here by an example in the colours of British West Indian Airways. The Srs 30 on which Douglas first flew a pair of JT8D-109 engines in 1975, seen making its first take-off on 9 January that year. 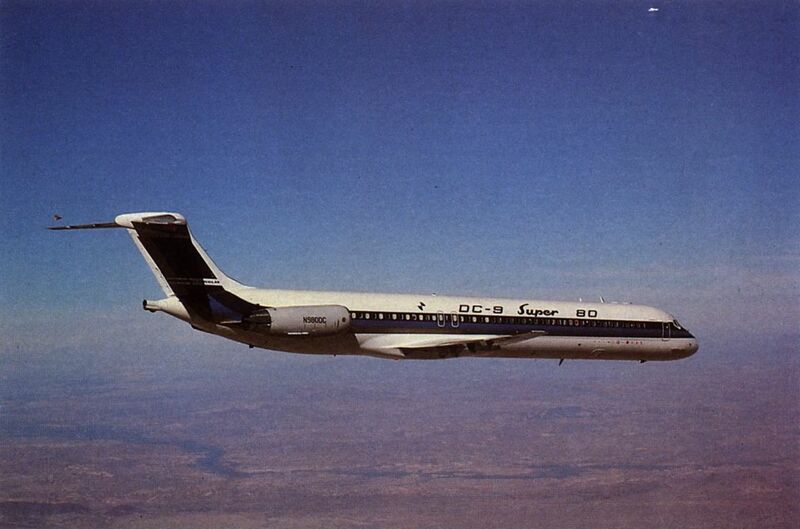 The first, and to date only, British operator of the DC-9 is British Midland, whose original Srs 10 is shown here. The first Srs 30, in Eastern colours, taking-off on its maiden flight on 1 August 1966. 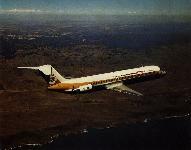 Ghana Airways is one of the several airlines to have ordered the DC-9 Srs 50. Well shown in this view are the underwing vortilons as well as the trailing edge flap guides. A Srs 10 in service with Ozark in the USA. 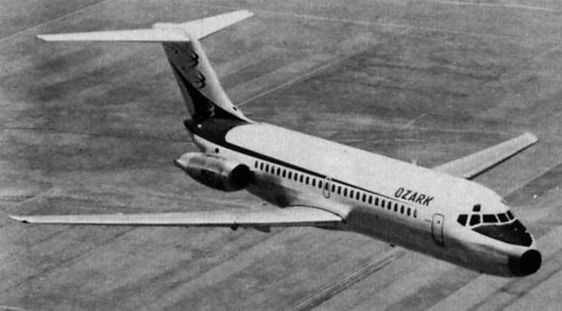 One of the first DC-9 Srs 40s in service with SAS, for whose requirements the type was primarily developed. It has also been purchased by TDA in Japan. 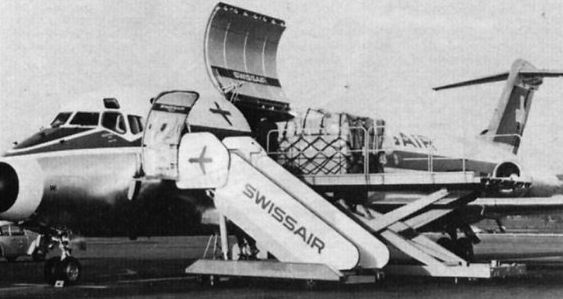 A windowless DC-9F Srs 30 used by Swissair, showing the cargo-loading door open. A DC-9 Srs 30 in the smart new colour scheme of US Air (formerly Allegheny), one of the many US regional operators to use the Douglas twin-jet. The first of 21 DC-9 Srs 30s supplied to the USAF as C-9A Nightingales for medevac duty with special purpose units of the Military Airlift Command. A C-9B serving with the US Marine Corps. 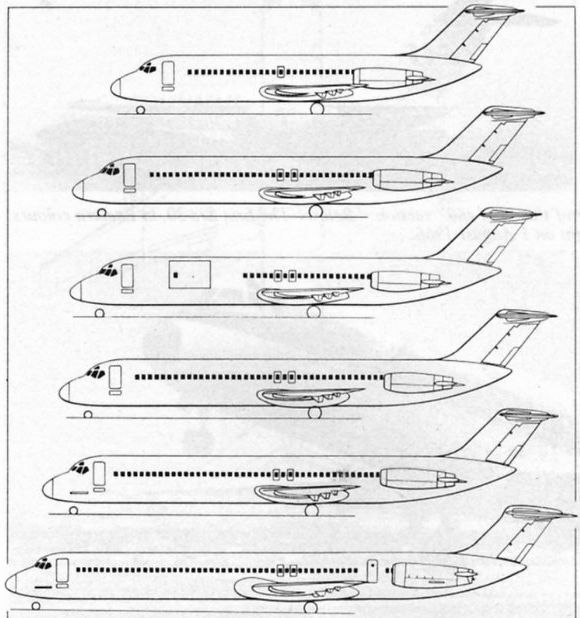 Comparative side views depicting (top to bottom) the DC-9 Srs 10/20; Srs 30; Srs 30F/C-9A Nightingale; Srs 40: Srs 50 and Super 80. The first DC-9 Super 80, which entered flight testing on 18 October 1979, is fitted with a spin-recovery parachute in the non-standard fairing at the rear end of the fuselage and has a trailing static line extending from the top of the fin. 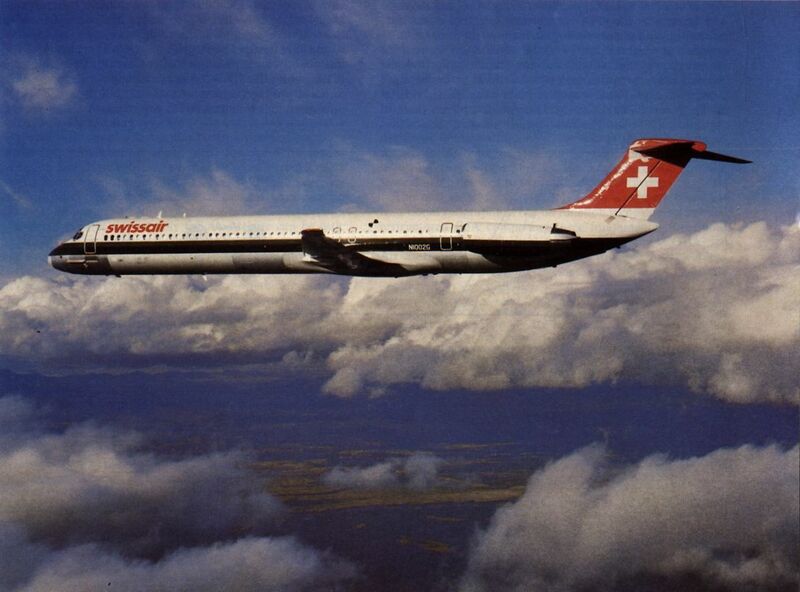 The second Super 80, in Swissair colours. The third DC-9 Super 80, in Austrian Airlines colours, takes-off from Long Beach Municipal Airport. Well shown in this view are the strokes fitted to the engine nacelles to improve airflow over the tail when the aircraft is at high angles of attack; similar strokes on the nose, first adopted on the Srs 50, serve to increase fin effectiveness. 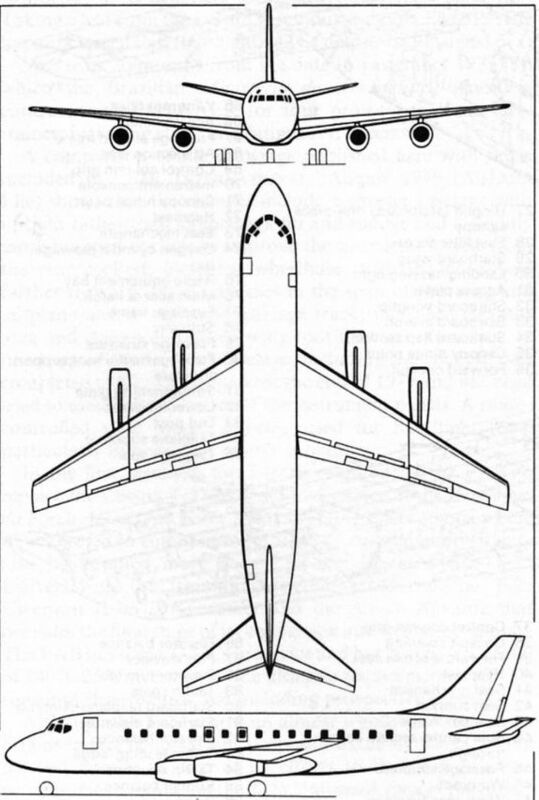 An artist's impression of the DC-9 Super 80SF project, which has the same wing and powerplant as the Super 80 but a shorter fuselage.